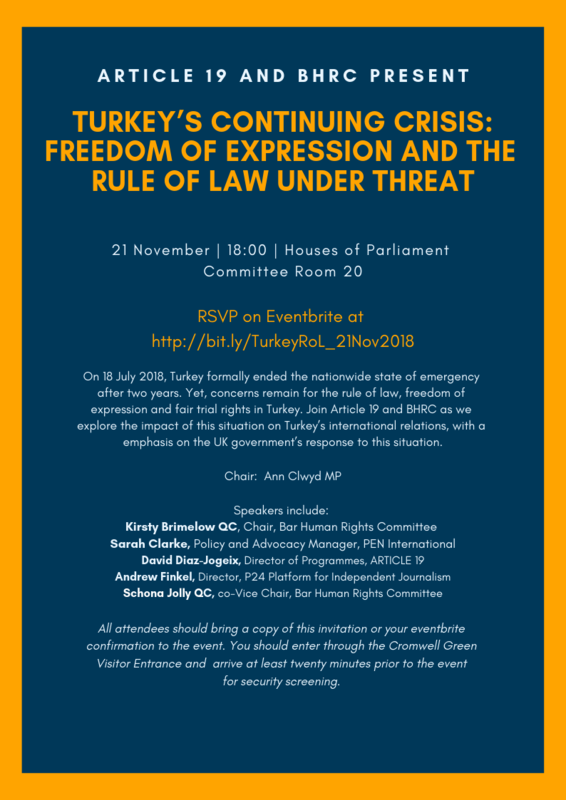 Bar Human Rights Committee of England & Wales and ARTICLE 19 will host a panel discussion highlighting urgent and continuing concerns about freedom of expression and the rule of law in Turkey, which has jailed more journalists than any other worldwide in the last two years. The panel event, chaired by Ms Ann Clwyd MP, is hosted by the All-Party Parliamentary Group on Human Rights. On 18 July 2018, Turkey formally ended the nationwide state of emergency after two years. Yet, even as Turkey find itself at the centre of worldwide attention on human rights and journalists, freedom of expression remains under attack as record numbers of journalists are placed on trial and international legal observers continue to raise serious concerns for the right to a fair trial and the rule of law itself in Turkey today. Guests can RSVP on Eventbrite here. All attendees should bring a copy of this invitation or your eventbrite confirmation to the event. You should enter through the Cromwell Green Visitor Entrance and arrive at least twenty minutes prior to the event for security screening.